Madeline Grove bed and breakfast is situated in the leafy suburb of Morningside, a stone's throw from trendy Florida Road, only five minutes' drive from the Durban Central Business District, Durban beaches, International Convention Center, Moses Mahbida Stadiums and uShaka Marine World. Rooms are air-conditioned with DStv. Heat and eat option in some rooms. 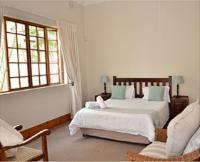 Other facilities include a sparkling swimming pool, secure off-street parking and complimentary wireless Internet access. Breakfast is continental and a English breakfast in the dining room overlooking our sparkling the pool, includes fruit juice, fruit, yoghurt, cereal, freshly baked muffins or croissants, toast with jam, cheese, tea and coffee. “You acknowledge and understand that there is a swimming pool on these premises. We will attempt to ensure that the gate to the fence around the pool is kept closed and latched but cannot guarantee that the users of the pool will always do so. If you or any of your family/party, such as young children, are not able to swim you are warned... “You acknowledge and understand that there is a swimming pool on these premises. We will attempt to ensure that the gate to the fence around the pool is kept closed and latched but cannot guarantee that the users of the pool will always do so. If you or any of your family/party, such as young children, are not able to swim you are warned against the existence of the pool. As such, by your signature hereto, you hereby indemnify the owners, employees and agents of these premises from any and all harm to you or members of your family/party which may arise from any incident involving the pool. 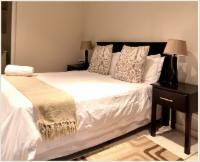 115 Queen Sleeps 2 Includes: B & B Rooms / Units: 4 Tastefully decorated rooms with shower, The room amenities include Dstv. tea and coffee, aircon. My room was a budget one and I think it is basically that. I had a fine two day stay, no problems, linen was clean and breakfast was good. I have enjoyed my stay. Everyone has done more than expected, the staff and also the security guy that was working Tuesday night was more helpful and friendly. I would love to come to Durban and stay there again. Their driver is more than welcoming. We had a lovely and comfortable stay at Madeline Grove. We'll definately be coming back when we visit Durban again. 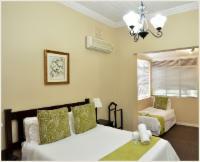 Owner is very accommodating and flexible and truly see to the individual needs of their clients. Staff went the extra mile to make our stay comfortable. My car was washed and my clothes were ironed, even without me requesting this! I will highly recommend Madeline Grove to family and business acquaintances. Inclusive good wifi connectivity and safe, enclosed parking was an added bonus. The location is perfect, central and our stay was absolute value for money! If you need a quiet place to relax whilst still being close to great restaurants, this is perfect. 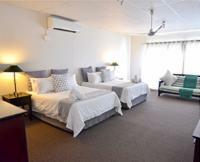 Madeline Grove Bed and Breakfast is 3.1km from the centre of Durban , the nearest airport 26.5km (King Shaka International Airport).